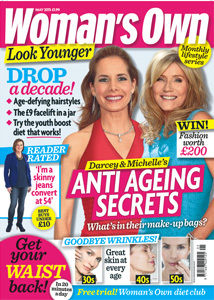 Time to get your copy of our summer edition of Woman’s Own Look Younger. Packed with the latest innovations in beauty – from magical stem cell creams and organic facelift treatments to the ultimate ant-ageing diet (it works! ), you’ll also find age-defying hair and make-up looks for 2013. There’s also all you need to know on how to wear the latest fashion trends – and they’re at brilliant prices, how to get salon hair colour at home and more! We’ve also interviewed our favourite stars to learn their look younger secrets. When is comes to getting into shape for the months ahead, look no further than the Six Moves To A Younger Bum! So, pick up for copy for a fresher, younger, radiant you. Woman’s Own Look Younger is out NOW!